The $3395 Poly 916NF4 is the first desktop system outfitted with two graphics cards that we've tested for the Top 15 Desktop PCs chart. 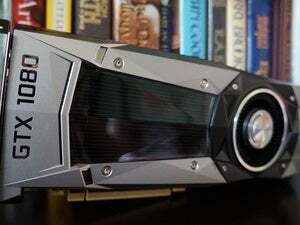 It uses NVidia's scalable link interface (SLI) technology, which enables it to run two NVidia GeForce 6800 GT PCI Express graphics cards in parallel, splitting the graphics processing between them. Though you might expect SLI to improve gaming performance, the results in our tests were mixed: The frame rates were very high in Return to Castle Wolfenstein, but less impressive in our other video game: At 1280 by 1024 resolution and 32-bit color depth, the Poly 916NF4 generated 290 frames per second on Unreal Tournament--nearly double the average, but far short of the 413 fps generated by the $2835 Polywell 939N-FX55, which we tested with a single NVidia GeForce 6800 Ultra graphics card. To be fair, these two test games don't take advantage of SLI; they were written before any SLI systems came out, and they don't push the graphics processing capability of one modern graphics card to the limit, let alone two. Only a handful of recently released games (such as Doom 3) do. More power-hungry games are likely to come on the market, and those games will hopefully take advantage of SLI. But for now, most users simply don't need the extra power. Moreover, you will have to pay a premium for the SLI feature--the same Poly system with just a single graphics card costs about $600 less. For a detailed explanation of SLI (and test results for games that do take advantage of it), see our story "Superfast Graphics." The games we use in our tests looked attractive on the 19-inch Avidav LCD monitor that came with our review unit, but it seems odd that the monitor included with an SLI system can't support 1600-by-1200 resolution--the resolution at which you might see an advantage to SLI. Both our DVD test movie and our still photos had flat colors on the display, and the DVD showed some ghosting in fast-moving scenes. Having two graphics cards means that the system needs a lot of power. Our test unit came with a 550-watt power supply, which can deliver much more juice than smaller ones, but it can also generate considerable heat. The air exiting the case became pretty warm when I ran a taxing, heavy-duty graphics application. After about an hour, my thermometer read over 100 degrees Fahrenheit, toasty enough to heat a small room. With a 3.6-GHz Pentium 4 and 2GB of DDR2-533 RAM, the system snagged a WorldBench 5 score of 102: very respectable, but significantly slower than similarly configured Athlon-based systems we've tested, which often score over 110. Though the case is large, the two graphics cards, two hard drives connected in a RAID array, and two optical drives (a 52X CD-RW and a 16X DVD&#177;RW) crowd the interior. The system's unused cables are tied together; you have to push them out of the way and unplug everything to access the two vacant externally accessible drive bays and the single unoccupied internal drive bay. There are three open PCI slots, but one is blocked by the large fan on one of the graphics cards, leaving only two slots available. The Microsoft wireless keyboard and mouse that came with our test system were comfortable to use, though the keys felt a little mushy. Only hard-core gamers will need the graphics horsepower that this pricey Poly's twin graphics cards provide. Mainstream users should go for a system that offers more bang for the buck.